Even if you know absolutely nothing about the law, the education that you receive from reading Common Law Remedy will teach you in minute detail about the secrets “The System” doesn’t want you to know. What you don’t know can and will hurt you (financially and otherwise). You don’t need to have a law degree to defeat any frivolous traffic citation. You just need to know a few simple concepts and how to assert them in order to avoid the court’s jurisdiction and assert your rights. One little known secrets is: the traffic code system of law enforcement in this country is so flawed and exploitable in so many ways, it only takes a small effort on your part to expose it for the fraud that it is! 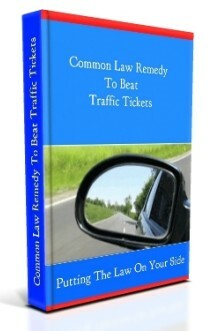 Get your copy of Common Law Remedy To Beat Traffic Tickets now! Simply enter your email address in the form below, click on the request button, and once you have confirmed your request, we will send you to a link to download your free report. Please understand that you will first need to confirm your request for this information by confirming your subscription. Watch for our confirmation email to your inbox or spam box. Then click the confirmation link to receive your download link. WARNING: If you should use a phony email address in your subscription submittal in order to protect your privacy, you will not receive the confirmation email, and we will not be able to email you the download link for lack of a valid email address. Also understand that you are under no obligation to continue with your subscription once you have received your complimentary report. Although, by opting out of your subscription, you may be cheating yourself out of receiving some valuable and useful information which will help you in your continuing education about actual law and how to apply it. Special Note: We have been experiencing a malfunctioning of the autoresponder service we are using. If you, for some reason, should not receive a confirmation email within 15 minutes to an hour of submitting this request, please send us notice of such at: contact@beattraffictickets.org and we will manually send you the link for your download. If this should happen to you, we sincerely apologize for any inconvenience. Please fill in and submit the form below to receive your report and subscribe to our mailing list. Privacy assurance: Your email address is never shared, sold, or exchanged with anyone. * This is a FREE service provided by http://www.beattraffictickets.org. ** You need to please double check your email for accuracy to ensure you receive the report. *** By submitting your request, you subscribe to our follow-up newsletter, from which you may unsubscribe at any time.